In the coming days before Irma, Southern Floridian’s quickly realized this wasn’t a storm that called for a hurricane party, considering it was the largest storm recorded in the Atlantic in history. With the category 5 only days away, most locals decided it was best to leave their belongings behind and head north, including many of us here at Douglas Realty. While riding the western coastline, the sudden right turn into Marco Island spared the Cape Coral, Ft Myers, and Lehigh areas from total destruction as the landfall forced the storm to calm down, slightly. 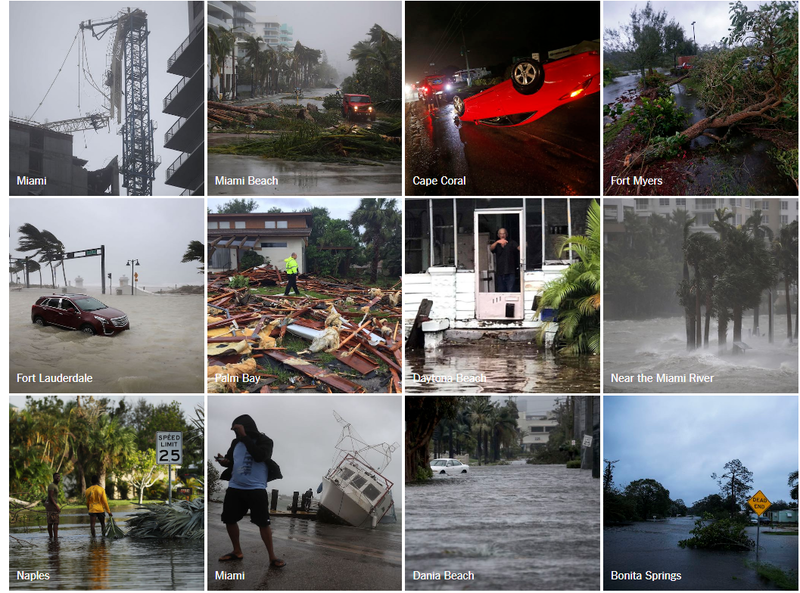 Naples and Marco Island are generally a wealthier area, and are rebuilding and getting things back to normal relatively quickly, even though some areas saw total devastation. Thankfully, most of our tenants and owners had to only deal with minor damage, like small trees coming down, knocked over fences, and blown out pool screens. The threats of 10-15 ft storm surges, the most worrisome part of a hurricane, never came. Thank God. Some properties weren’t so lucky, as parts of roofs blew off, were left without power for weeks, and minor flooding did occur. In fact, the wind was so strong in some cases, the rain water was blown up into the fascia and went down the inside of the concrete walls and created mold and flooding issues. A true testament to the power and force of 100+ mph winds. On the other hand, some properties in the Cape Coral area never even lost power, and the residents that stayed behind had food in the fridge, access to TV, and rode out the following few days as roads were cleared, and stores began to reopen. Rumor has it the first local restaurant to open was a Chinese strip mall store that had lines out the door! If you’ve never lived through a hurricane, it’s tough to describe the shift in society that takes place just days before the storm. As pumps run out of gas, and stores simply have no more canned goods or water, there’s a sheer sense of panic and “on edge” you can feel in the air. While all of us here at Douglas were trying to make our own preparations for our families, the coordination effort of helping out tenants and owners put up hurricane shutters was pure chaos. We created a first come first serve spreadsheet of owners who were wanting shutters put up, and of tenants who were requesting to put their own up. The phone switchboard looked like a Christmas tree, and an all hands on deck approach had every employee on the phone with tenants, owners, and contractors trying to coordinate where to go put up shutters. It was like a scene out of a horror movie. There was another factor that made it nearly impossible…there simply was no plywood. This is the type of wood most contractors use to screw into the concrete walls to cover the windows from flying debris that make contact with the glass. We were all left wondering, why wouldn’t these stores and the state of Florida have extra sent down to help us prepare? Hopefully it was a lesson learned. As the storm swept through Sunday night, we decided to remain closed until Wednesday to give employees a chance to recover and get home. The problem was, none of the offices had internet, electricity, or phones for almost another week. Some clients had access to employee’s personal phones, which were ringing off the hook with clients asking “was my property damaged, is everything ok?”. Most of us were still out of state at that time, let alone the roads were in no condition to drive around and look at property. I think when someone is living out of state, or never experienced a hurricane, it’s tough to grasp the magnitude of the situation, and that everything takes time to recover. This storm brought out the best in our staff, plain and simple. Every tenant was called, asked for a damage assessment, and every owner was called to report the situation. Almost 1,500 phone calls made in a matter of a few days to report damage and get things coordinated and fixed as soon as humanly possible. Emailing back clients from their phones in the office parking lot because the A/C unit was taken out and the office was 95 degrees inside. On the phone with LCEC getting status updates. Working through the weekend…it was an amazing thing to watch a group of people come together and handle such a horrible, chaotic situation. Things are finally getting back to normal, and then some. Many people a little south of our area of business were displaced from their homes and are looking for a place to rent for a year. We are finding a large increase in rental inquiries, which is helping properties rent quickly and helping find people a home after a tragedy is gratifying. The sales market is starting to turn again, and with season around the corner, should remain strong.